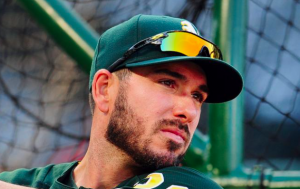 Major League Baseball has suspended Oakland Athletics outfielder Matt Joyce two games following an incident with a fan on Friday. Mark J. Terrill, a photographer with the Associated Press covering Oakland’s game in Anaheim against the Angels, reported that there was an exchange between Joyce and a fan in which Joyce used a gay slur toward the fan. The suspension will begin on Saturday. The roughly $54,000 Joyce will lose in salary from those two games will be donated to PFLAG National, a LGBTQ advocacy organization. The incident occurred in the 8th inning of Friday’s game after Joyce hit a hard ground ball that was stopped by Angels first baseman C.J. Cron. According to the Terrill, in addition to calling the fan a gay slur, Joyce also challenged the fan to a fight. However, Terrill admits that he did not hear what the fan said to Joyce that set him off. On Saturday, Joyce issued a public apology to both the fan and the LGTBQ community in a series of tweets. “In regard to last night’s incident, I first and foremost want to sincerely apologize to the fans, the Oakland A’s, MLB and the most importantly the LGBTQ community for my comments and actions. A fan yelled vulgar and obscene words about me and my family and I let my frustrations and emotions get the better of me. “I am beyond sorry for the inappropriate language that I used and understand and agree that those words should NEVER come out of someone’s mouth no matter the situation. Anyone who knows me will tell you that incident it is not reflective of me as a person, how I treat others, how I live my life and that those hurtful words are not my views. Friday happened to be Joyce’s 33rd birthday. This is his 10th season in the big leagues and his first in Oakland. After a career year with the Pirates last season, Joyce has come back down to earth. On the season, he’s hitting .227 with 14 home runs and 20 doubles, producing an OPS of .727. Unfortunately, this is the second time this season a major leaguer has been suspended for using a gay slur. In May, Blue Jays outfielder Kevin Pillar was also suspended for two games after he yelled a slur in the direction of Braves pitcher Jason Motte. Joyce will miss games Saturday and Sunday against the Angels. He will rejoin the last-place Athletics on Tuesday when the team begins a series in Oakland against the Seattle Mariners.